The next generation Suzuki Swift is reportedly nearing full development as Suzuki would be unveiling the 2011 Suzuki Swift at the Paris Motor show to held in October 2010. Based on a completely new platform, the next-gen Swift derives almost all of its styling cues from the current generation Swift but has a much more sleeker, sporty air about it. The head-lamps on the test mule, for instance resemble the current car's, but they are swept back and sharper. The 2011 Suzuki Swift appears to have grown in size but this doesn't show much thanks to the sleeker front fascia, which is a result of Suzuki's new design language, first interpreted on the Suzuki Kizashi. The interiors of the 2011 Swift also seem to be more refined and classy compared to the current generation's Swift. The 2011 Suzuki Swift Sport is also rumored to come with all wheel drive, the testing of the Swift at the Nurburgring seem very suggestive to this speculation. Suzuki would be hoping to give the new Swift a new engines. In addition to the current 1.2l KB series engine and the 1.6l VVT engine, a new 1.5l KB series engine could find its way under the hood of the 2011 Swift. These engines would be mated with a CVT transmission. 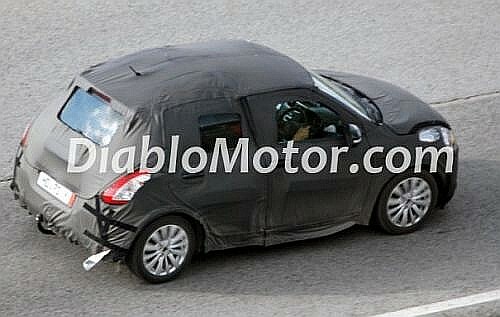 Suzuki could also be planning to develop a low-cost plug-in hybrid Swift. Also with a possible VW-Suzuki JV, Suzuki could also borrow VW torquey 1.2l and 1.6l TDI diesel engines which could end Fiat supplying the 1.3l Multijet diesel engine to Suzuki. The Swift could also get new direct-injection petrol engines mated to VW sourced DSG transmissions. From the Indian context, the new Swift would find its ways to the showrooms before the first quarter of 2011. It is unclear whether Maruti Suzuki India would would be replacing the current model or selling the 2011 Swift alongside it. We at Indian Autos Blog feel is that Maruti should for once do away with its habit of selling multiple generations of cars together and replace the Swift with the new model. As the new car wouldn't drastically look different, this could trigger confusion among the consumers and could lead to a debacle. Click here to view renderings of the 2011 Suzuki Swift by our man SRK.